Having grown up reading the Tintin comic books and having a father that is even more obsessed with the series, the new Tintin movie is something that I have been waiting for. With the new release of the Tintin movie, of course there is going to be a video game or application to go along with it. The Adventures of Tintin is based on the recently released film and sticks to the storyline of the movie for the most part. For this iPhone app review I used the iPhone 4 but this game will work fine on an iPod touch as well as the iPad. It was quickly apparent that the developers put extra effort into creating amazingly sharp and polished 3D graphics in this game. The app’s 850 MB download size tells you just how much hi-res content is included in this game. The game’s opening seen has Tintin in an open market, holding a model ship. Almost as soon as Tintin purchases the ship a man approaches him asking to buy the ship from him. The man, Ivan Ivanovitch Sakharine, leaves and shortly later Tintin is jumped and ship is stolen. This robbery, of which Tintin believes he knows the culprit, sets the scene for the rest of the adventure. 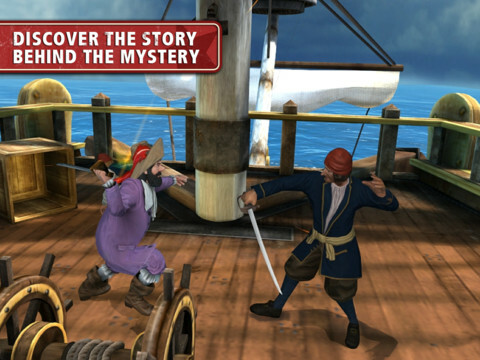 The Adventures of Tintin for iOS blends a combination of a number of different genres in order to keep the user interested throughout the gameplay. 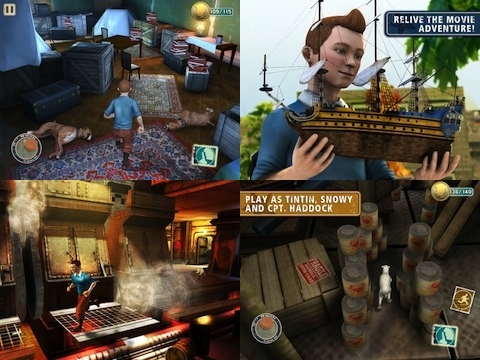 As Tintin, users are asked to complete a number of different tasks that Tintin would routinely go through in one of his adventures. At one moment Tintin is sneaking into a mansion and next he will be trying to escape capture. All during this time the perspective for the user is changing which is one of the unique aspects of this application. Like many touch screen games, the controls are responsive for the most part but there are always some controls that do not function as well as they could. Part of this could be due to user error or to error in design. The swipe function lacks the responsiveness one would desire but hardly limits the functionability of the adventure. Tintin is controlled via a d-pad and reacts sharply to input. Another nice implementation is motion controls, which the user is asked to turn on at the beginning of the journey. As I mentioned before, the best feature of the Adventures of Tintin are the graphics. Tintin looks especially sharp and the various settings that he is interacting in are smooth and transitions are seamless. Unfortunately what the adventure makes up for in graphics, it lacks in voice acting. Often the voice acting leads to crashing and entire levels would have to be replayed due to the loss. This became frustrating after some time and I had to walk away from the adventure. A fix in this bug would make this journey much more enjoyable. The Adventures of Tintin has a number of amazing features that makes it a worthy download for anyone who is a Tintin fan. Its high quality graphics are some of the best to come out recently in the iOS app scene. Unfortunately the infrequent crashes make this game frustrating and hard to play for an extended period of time. Overall, The Adventures of Tintin is something worth downloading, once Gameloft has fixed these bugs. AppSafari review of The Adventures of Tintin – The Game was written by Joe Seifi on December 27th, 2011 and categorized under Adventure, App Store, Games, iPad apps, Kids, Universal. Page viewed 6155 times, 2 so far today. Need help on using these apps? Please read the Help Page.